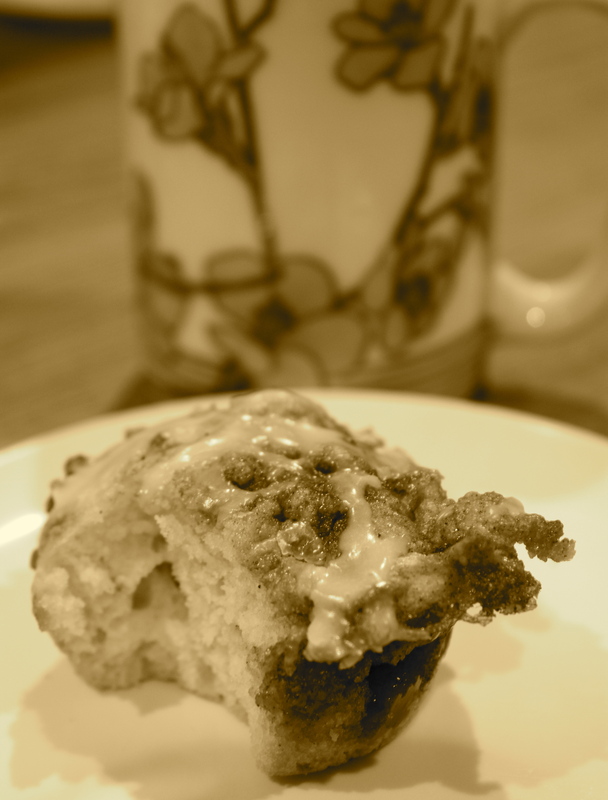 Cinnamon Roll Muffins | "Il faut goûter"
These muffins are like cinnamon rolls, unrolled. De-rolled. They’re really ‘drop cinnamon rolls’ (think drop biscuits). They’ll make you hear sweet sweet breakfast music. This morning I wanted to make some sort of sweet bread for breakfast, but I didn’t want to wait hours for dough to rise. So I found these muffins on Joy the Baker’s blog here. Though Joy’s recipes are always awesome, this one calls for double the amount of yeast that I used, and that seems like far too much for only 12 muffins. For mine, I used only 1 package of yeast, and I added a bit of ginger. They were delightful, and the texture of the bread is great, tasting slightly of warm yeast, which I find highly pleasant. They’re sweet enough without the glaze, but it gives them a nice finish and again hearkens back to warm gooey cinnamon rolls. I recommend enjoying them with a pretty cup of strong black coffee. In a large bowl, combine flour, sugar and salt. Dissolve the yeast in a measuring cup filled with the warmed milk, then stir milk mixture, vegetable oil, vanilla extract and egg into the flour mixture. Mix until very smooth–the batter/dough will be thick and sticky. Let the dough rest in the bowl for 15 minutes. While the dough rests, mix together butter, brown sugar, cinnamon, and ginger in a small bowl using a fork until all the butter has been incorporated into the sugar and mixture is crumbly. Divide the batter between 12 greased muffin tins. 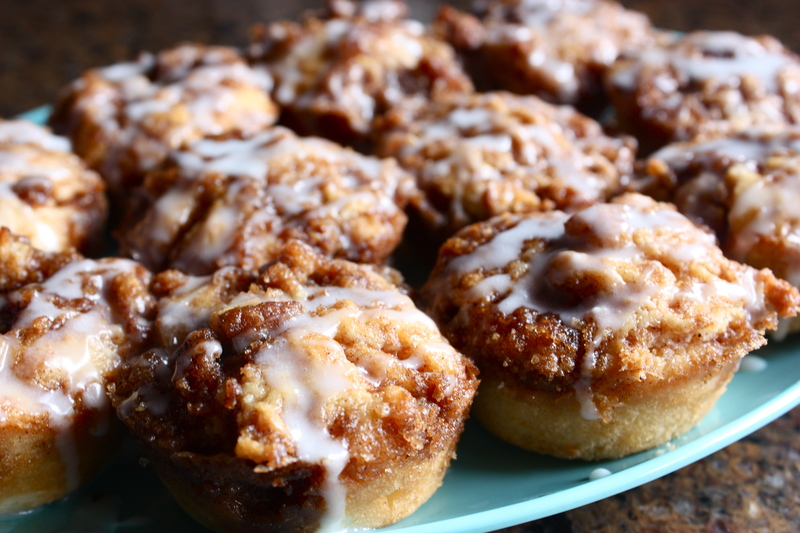 Sprinkle the cinnamon/sugar/butter mixture evenly on top of the batter in each muffin tin. Press the mixture down into the dough with your fingertips (or swirl in with a small butter knife.) *Try to push it down into the dough, because when they bake they’ll rise and the topping will bubble and spill over sides–don’t worry if this happens–just spoon it back on top of the muffins! Bake for about 20 minutes, until muffins are lightly browned at the edges and the center of the the muffin springs back when lightly pressed. Some of the sugar mixture on top may still be bubbling. Cool about 10 minutes in muffin pans, and make the glaze while the muffins are cooling. (To make the glaze, whisk together the powdered sugar and milk.) Transfer the muffins to a serving platter and cool 10 minutes more. Drizzle the glaze atop the muffins and serve warm. Can’t wait to try these. I love making my “One Hour Cinnamon Rolls” but don’t always want to take the time or want that many rolls. This looks like a great way to address those issues! Thank you!